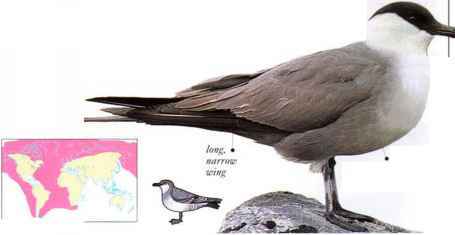 Resembling a large, brown gull, this species is a powerful, predatory seabird that dominates others within its range. It feeds by catching fish, taking eggs and nestlings of seabirds, and killing adult birds, including gulls, ducks, and shorcbirds. Although its flight is normally powerful and slow, it can chase birds with speed and agility. It forces them to disgorge fish that they have swallowed. When nesting, it shows off a large, white patch on each wing in "raised wing" displays and fiercely attacks all intruders. • NEST A depression on the ground, lined with grass, moss, or heather. Birds nest in colonies at a few locations on islands in the ocean. N. Atlantic. Winters at sea, some birds reaching equatorial waters.